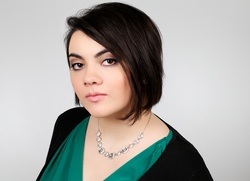 Marissa Lenti is an anime voice actress who you can hear as Cocotte in Dragon Ball Super, Libra in Fairy Tail, Mistress Sadie in One Piece, Ilse Langnar in Attack on Titan: Junior High, Momoko Hyakushiki & Kuu in NANBAKA, Chiaki Hoshinomori in Gamers!, Alicia Florence in Aria the Animation, Wolfie in Hells, and Atsuko Yoshida in Keijo!!!!!! !, among others! She's also appeared in many video games, like SMITE, Paladins, Yandere Simulator, Huniepop 2, My Tamagotchi Forever and more. When she's not acting, she's casting & directing for Sound Cadence Studios, with some of her recent projects being the English dubs of the anime B't X, This Boy Is A Professional Wizard, and This Boy Suffers From Crystallization, as well as providing additional casting for Rooster Teeth's RWBY, gen:Lock, Red vs Blue, Nomad of Nowhere, and Camp Camp. She's also an ADR Writer for Sentai Filmworks, providing the scripts for Bloom Into You, Tada Never Falls In Love, and Armed Girl's Machiavellism to name a few. To learn more about Marissa, check out her website at www.marissalenti.com or follow her on Twitter or Instagram (@MarissaLenti)!